All the movies under the keyword=LGBT are used in the analysis below. When creating a bar chart or indeed most types of charts in Excel, you will usually end up with a simple legend that labels your data without any description. For example if you create a stacked column chart with three color-coded data series you will need a legend to explain the colors. While Excel will automatically put labels on them, such as Sales, Expenses, etc. you may wish to provide additional information. In order to do this you must first create your chart in the normal way, with a typical legend. Suppose your information reflects increases or decreases of some KPI, such as profits. Assuming your profit figures are in the column A3 to A10, you can set up a formula such as this… =IF(A10>A3, “up arrow symbol”,”down arrow symbol”) & “Profits by”&TEXT(A10/A1-1,”0%”). You can repeat this process for each of your data series. You must now add text boxes at the bottom of your chart where your descriptions will be placed. Click on ‘Insert’, followed by Textbox, after selecting the chart. Make sure that you format the text boxes so that they have the same colors as their corresponding data series’ on the chart. Then you can select the first text box, and in the formula bar you can add the formula that you have already set up to provide the correct legend for this data series. This step should then be repeated with the other text boxes. Although pie charts are quite common and almost universally understood, they are often misused. While they are suitable for data sets with a small number of data points, many people often try to use them for data series with multiple points. This means that they end up with a chart that has so many segments it is almost illegible and generally unintelligible. While it is best to avoid pie charts if your data set is above a certain size, there may be occasions when you feel obliged to use one for certain reasons. In cases such as these, it is best to make use of a pie chart where any small segments are grouped together as one unit. When creating a chart like this you should take the standard approach of selecting your data and then click on ‘Insert’, followed by ‘Chart’. Then choose a ‘Pie of Pie’ chart. This will give you a large pie chart, with a smaller pie chart providing a ‘blow-up’ view of the smallest segments. Once you have created your chart you can then right click on it and select ‘Format Series’. Choose ‘Series Options’, and then Split Series By Percentage Value. You can then choose which segments will be shown in the secondary pie chart by setting a percentage limit. Everything below this limit will be transferred to the smaller chart. When it comes to generating a chart in Excel for your dashboard there is a huge range of options and customisable features. This allows users to create charts that are distinctive and attractive, while also giving them the capacity to build dashboards that are perfectly suited to their needs. One of the lesser known options that is available with Excel is the ability to add colored labels to your charts. This is a very simple procedure which produce a nice effect. Firstly you will have to apply data labels to your chart, and then format them. Then you right click on the data cell in order to open up the formatting options. From here you will have to go to the ‘numbers’ tab. This tab is generally used as a means to specify how you wish to have the digits in a particular cell displayed. For example it allows you to choose a date layout, a fraction format or a scientific numbering layout. However it is also possible for you to use this formatting menu to choose colors for your data label. In order to do this you must choose the ‘custom’ option from the menu and then enter a specific colour code. For example, if you want to colour all of your negative values in red, but all of your positive data labels in green, you should input [green]+0%;[red]-0%. This is a very straightforward and logical code that can easily be adjusted to suit your requirements. Once this has been done you can then see that the data labels of your chart have been color coded. The vast majority of charts are vaguely box shaped. There are of course exceptions, such as pie charts and gauges, but overall most charts are based on a right-angled framework of two axes. If you have decided upon a dashboard that makes use of quite a few charts of this overall shape, you might find that your entire dashboard ends up looking a little bit clunky and square. In previous posts I have discussed how distracting graphics and crazy colour schemes can make even the most informative dashboard appear cluttered and unintelligible, but that is not to say that some simple formatting techniques cannot be employed. There is actually a very simply technique to softening the angular appearance of these charts, which won’t obstruct the data or make them any less efficient. If you visualise a very basic dashboard with a clear white background and some charts superimposed on it, you will mostly likely find this image cold, unattractive and spartan. The same applies to a slightly lesser degree to a dashboard with a black background, or indeed any given colour. What you essentially have is a blank page containing charts. However using Excel’s built-in drawing features you can give a dashboard of this kind a much more integrated and organic appearance, with each of the elements fitting together nicely. What many people do not realise is that they can draw a shape on their dashboard and superimpose a chart on top of it. For example a coloured square can be used to provide a nice background for a single chart, or a combination of shapes can be used to create a simple but elegant backdrop to one a more related charts. Of course the chart must be created first, and its colour scheme chosen so that it is fully legible when placed on its backdrop. Then a shape can be selected from the ‘Insert’ menu in Excel, and formatted as per requirements. Multiple shapes can be added using drag and drop. Once everything is finished the chart can be dragged into place on top of the backing shape. 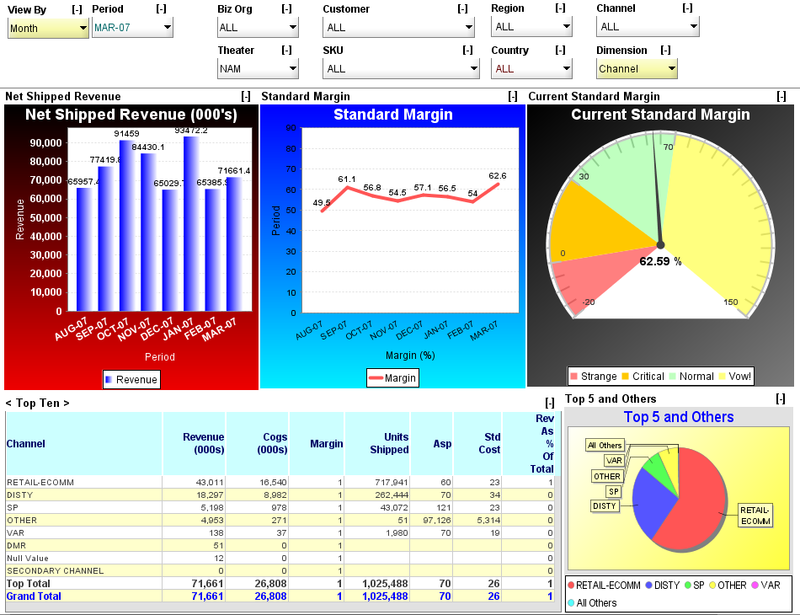 Dashboards are becoming increasingly popular as business intelligence solutions with a growing number of applications. 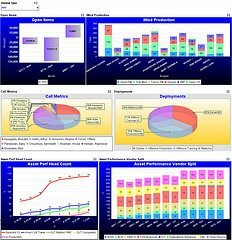 As this new approach to charting and data analysis develops, users and designers are constantly coming up with new approaches to dashboards and to charting. While most of us will have had experience with line charts, pie charts etc., during our school days, there are a number of new charts that can seem quite unfamiliar and often confusing. Bubble Charts are part of this new wave of charting, which takes full advantage of all of the features that modern computing has to offer. As the name suggests, these charts use bubble-shaped circles to display data sets on a graph. While the graph itself is two dimensional, having an X- and Y- axis, the bubble charts can be used to provide a three dimensional set of data. This is because there are three variables involved with the creation of this chart. Position is of course determined by the X- and Y- coordinates, which will represent various aspects of each data point. However the relative sizes of the bubbles themselves also provides another dimension to the data, creating what is effectively a 3D graph. To create a bubble chart in Excel you will therefore need to have three data columns. One of these columns will be used to determine the size of each bubble. Then simply select the data and go to Insert, Chart, and Bubble Chart. This chart can then be formatted in the usual way. When creating a dashboard it usually helps to have as many options as possible available to you. While most users know how to create common and standard tables and charts, there are a number of additional charting and tabling features available in Excel which are often neglected by inexperienced users. A Pivot Table is one such feature. Pivot Tables allow users to flip the columns and rows of the table to provide detailed information on certain aspects of your data. For example these tables can be used to summarize and analyse data in a number of ways. 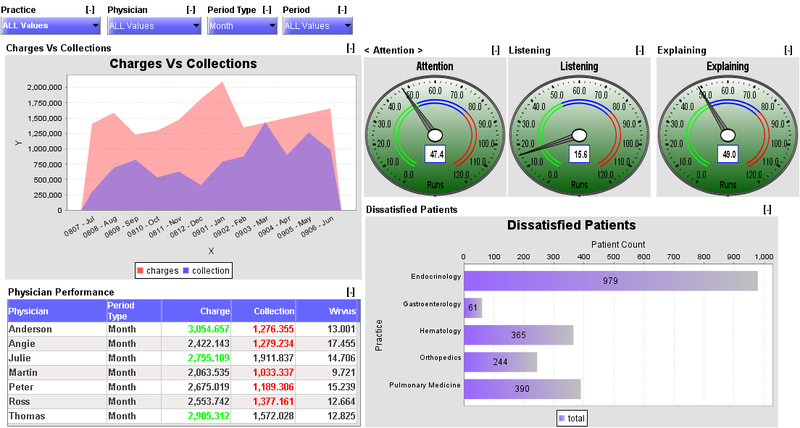 They can also be used to present data in a customisable layout, with calculations and subtotals. There really is a wide variety of uses to which pivot tables can be put, and it is worth spending some time researching all of the possibilities. In order to set up a Pivot Table you must initially select the data that you wish to use, then click on Insert, followed by Pivot Table. You must then choose a cell in which to place your table. Once this has been done you will be faced with a number of options. You can set up the table any way you want using drag and drop to place the data that you wish to analyse in the table. Once the table has been created you can then format it as you choose. The Excel Camera Tool is one of those tools that often gets neglected by Excel users. However this handy feature can be used effectively when creating dashboards, to provide detailed ’snapshots’ of your charts. The Camera Tool is very appropriately described by its title. 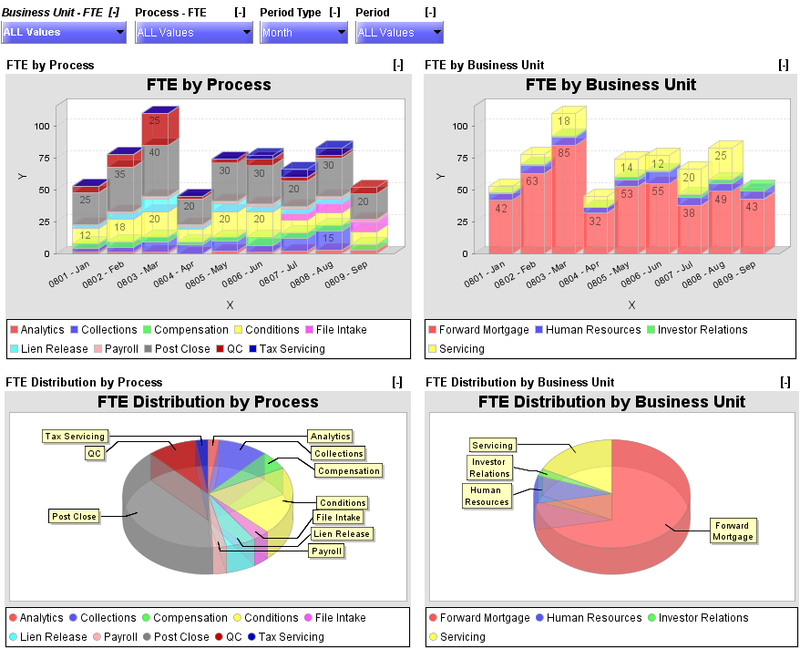 It allows users to select a portion of their chart and then create a mirror image or snapshot of this segment. The most useful aspect of this feature however is that it allows you to resize the mirror image, and then reposition it wherever you choose. In order to enable the Camera Tool, you must first add it to your Excel toolbar. This can be done by going to Menu, choosing Tools and then Customize. From there you will need to select Commands, and then go to Tools which will be in the Commands tab. You will then be able to locate a small camera icon, which you must drag onto your Excel toolbar. When the Camera Tool is enabled, all you have to do is to is select the cells in your chart that you wish to copy. Then click on the camera icon in your toolbar and then click anywhere on the page to display your snapshot. This can then be resized, to provide a larger or smaller image of your highlighted area. Previously we discussed what not to do when incorporating animations into your dashboard charts. However business intelligence software can be extremely useful and many of its features can add to your reports greatly if used in the correct manner. One of the key uses for an animated chart is as a means to display time development. If you create a chart that demonstrates how a trend evolved over time, this is an excellent candidate for an animation. A movie showing how the situation developed through the medium of your chart would be a highly effective and entertaining way for you to get your message across to the users of the dashboard. When creating an animated chart, it is important to include certain features. It should be possible to pause the chart at any point, so as to analyse its evolution at every step. It is also important that you animation run smoothly. A flash chart that develops in fits and bursts and has gaps in its data, will prove detrimental to your dashboard. Make sure that your chart operates smoothly and that it has a polished and professional appearance, otherwise it will look unprofessional and poorly planned.